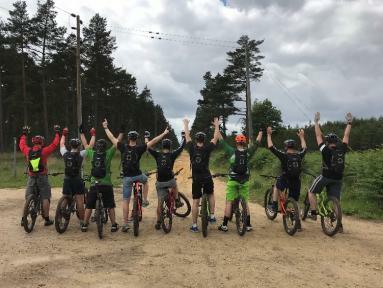 Caisson Investment Management's annual mountain biking event took place on Friday 9th June at Swinley Forest, Bracknell. Three members of Caisson hosted 14 riders drawn from companies who have worked with us over the past year including investors, property managers, investment agents and building surveyors. 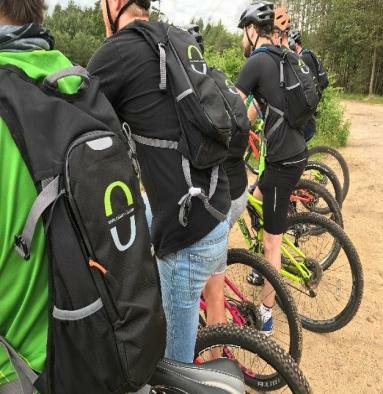 Starting with a hearty breakfast at The Lookout Discovery Centre in Swinley Forest, the riders were kitted out at Swinley Bike Hub, and left for the forest trails at 10 am, accompanied by a local professional coach. All were provided with hydration packs bearing the distinctive Caisson Logo which was not only essential considering the day’s exertions, but was also a useful souvenir of an action-packed day. The tired but happy group finished with a late lunch at The Golden Retriever pub in Bracknell. The day was a great success, and provided a welcome diversion from the General Election the previous day. “This event has quickly become an established part of Caisson’s annual calendar. Whilst both a different and challenging day it also gives us the opportunity to catch up and thank people who we have worked with over the past year” said Mark Bowden, Property Partner of Caisson. The team is already in training for next year’s event.